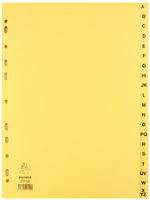 Set of 20 dividers alphabetically marked (A-Z). Great for organising your papers into a logical order. Punched to fit most standard A4 files. Made from robust buff manila Ideal for alphabetical filing. Index sheet for labelling and cross-referencing. Approx Dimensions (CM): D30 W22.5 H0.5. Approx Weight (KG):0.1551.